Published on December 26, 2007 in Homebrew and Recipe. 1 Comment Tags: bourbon, chips, oak, Recipe, wood. This morning I mashed in at 10 am to an overcast sky at roughly 40F. Things are going smoothly so far as recycling trucks go by picking up the waste of the past few days. I’m praying that the rain will hold off for another 2 hours, and that I don’t slip on the wet birch leaves on the deck as I carry hot pots of water out to top off the hot liquor tank. 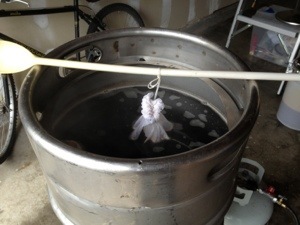 Today I’m brewing a fairly simple amber ale. It’s just 2-row and Crystal 60 and 80, with 1.5 oz of hops. I’m hoping to keep the flavor simple since I’m going to try and oak chip the beer in secondary with bourbon soaked toasted red oak chips. The bourbon is supposedly to “sanitize” the chips (blocks weren’t available) but I’m actually hoping to recreate a bourbon barrel flavor. I probably should have tried this with a bigger beer, but the amber will allow me to taste how the oak affects flavor. Now I should get back to the mash. It’s probably just about time to sparge. Published on October 4, 2007 in Homebrew and Recipe. 1 Comment Tags: Homebrew, ipa, Recipe. Here’s a recipe for the Imperial IPA I’m brewing this weekend. 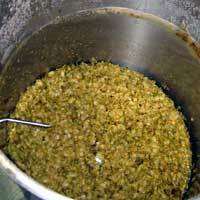 It’ll be an 8 gallon batch (5 keg, 3 bottled) and the hop bill is still under scrutiny. Seems like I should be able to fit some more more hops in there. I can’t find any information on whether S-05 will ferment enough to hit my target gravity. Edit: I changed the name of the beer at the last minute celebration of our friend’s newest, Maximus Charles Walz, born on Friday, October 5th. Nate’ll have get a batch as well, but a Scottish seems more appropriate. Published on January 9, 2005 in Homebrew and Recipe. 0 Comments Tags: Recipe. There are a couple I’ve never heard of, and one in particular makes me nervous. The Palisades are supposedly a new variety that could replace Willamettes. Willamettes are one of the most widely grown varieties here in the, uh, Willamette Valley, and the Palisade has a higher alpha acid content and a higher productivity, which could seriously hurt hop growers. Its one of those cases where the green revolution has surpassed its benefit to a large number of people and concentrated the benefit for one or two folks. You know who I’m talking about. The king of beers. Regardless, I’m pretty damn excited because many of these hops will be very useful in expanding the variety of beer styles I can brew. I know Crystal and Galena to be favorites of Rogue, and there are several noble-style hops that rarely use. Oddly enough – my coffee has taken on a distinctive hop flavor. Maybe I should move this box somewhere else. Published on November 12, 2004 in Homebrew and Recipe. 3 Comments Tags: Recipe. This weekend should include the brewing of a Nut Brown – Porter hybrid called South-of-Town Brown for my sister and her friend’s move to town, and their affinity for brown ales. Plus, its fall, and it sounds really good. If the batch goes well, I may reuse the yeast cake for another. Published on August 28, 2004 in Homebrew and Recipe. 1 Comment Tags: Recipe. I moved Hop Damn! to secondary today. The IBU count of 114 may be a little high, but its still bitter and has a great citrus aroma and full grapefruit flavor. 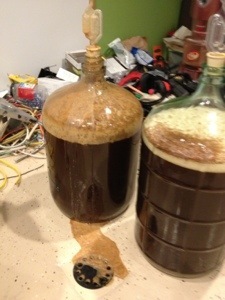 The gravity is still a bit high at 1.028, but its got a week left. I’m curious how I’m going to get a bottle carbonated enough to take to Hop Madness next Saturday. I have my doubts that it’ll win Best Damn Hoppy Beer in the Pacific Northwest, but it is good, and with any luck, it’ll get sampled near the end and will place.